Microsoft jumped further into the smartwatch app market Thursday, launching a trio of applications that put its services on users’ wrists. Apple Watch owners now have their own version of Outlook, and Microsoft has now brought OneNote to Android Wear after first making it available on Apple’s smartwatch earlier this year. Both watch operating systems also received a new Microsoft Translator app that will translate conversations without requiring users to pull out a smartphone. The Translator app lets users translate to and from 50 different languages via text. Using voice recognition, they can speak into the watch in the language their wearable is set to (assuming it’s among the ones Microsoft supports) and have it output in one of 50 languages. The app also lets users go back and view their recently translated phrases, and pin frequently used translations so they have quick access to key phrases. Outlook for Apple Watch builds on the application’s existing rich push notifications to give users a feature-filled email client for the smartwatch. The app shows preview versions of unread messages in users’ inboxes and lets them reply, archive, delete, flag, mark as read and schedule messages to reappear later. Messages sent from a user’s watch automatically have the appropriate signature attached to them, as well. Tapping into Outlook’s built-in calendar, the Outlook app for Apple Watch also includes a run-down of everything that’s on a user’s calendar for the day. There’s also a Glance included with the app that shows users how many unread messages they have along with the next event on their calendar. 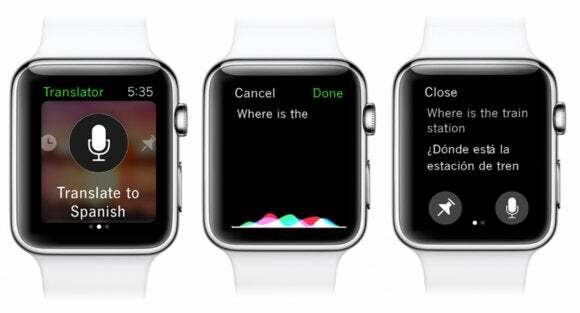 Android Wear users catch up to the Apple Watch with the launch of OneNote for Google’s mobile platform. The app lets people view notes they have saved through Microsoft’s note-taking service, and dictate notes to their wrist by saying “Ok Google, take a note.” Microsoft previously offered a OneNote for Android Wear app, but that only offered the ability to dictate notes on a smartwatch. Wunderlist, the to-do list app that Microsoft purchased earlier this year, was updated to let Apple Watch users quickly add items to their list by pressing and holding on the Watch’s screen and then dictating what they want to add. Moving forward, Microsoft is bringing more of its applications to wearables, and plans to add a Yammer app for the Apple Watch in the near future. That application will let users “like” posts made to their company’s social network, mark messages as unread or hit “View on Phone” to keep working on messages through the Yammer app on their iPhones. 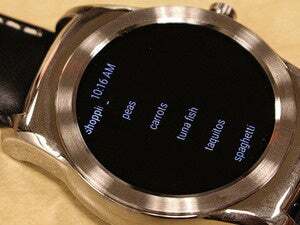 There’s also plenty of room for Microsoft to expand its Android Wear offerings. Google’s wearable platform is still missing an Outlook app, along with an app that allows users to control PowerPoint presentations from their wrist (something that’s already available for the Apple Watch). It’s all a part of Microsoft’s ongoing push to get its apps in front of users on as many platforms as possible, even if the Redmond-based tech titan doesn’t own the underlying operating system. CEO Satya Nadella has made developing productivity tools for a “mobile-first, cloud-first world” a priority during his tenure at the company, and these wearable apps are just one component of that plan.